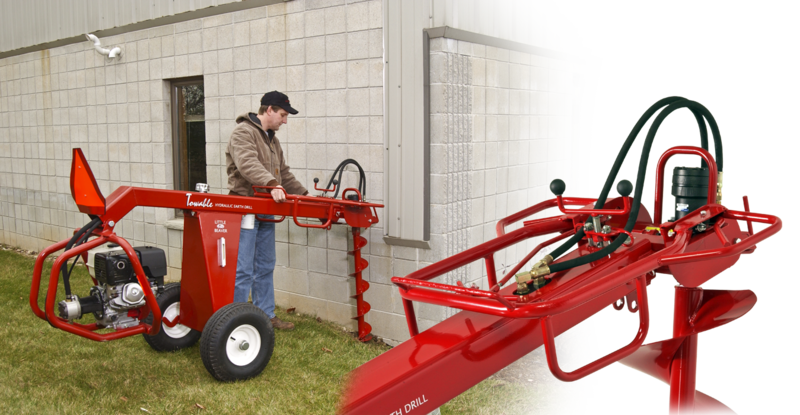 Little Beaver’s towable, hydraulic auger drill certainly has all of that…and more. When we designed the HYD-TB11H, we weren’t interested in developing an ordinary, “me too” machine. Our goal was to design a towable, hydraulic auger machine that was clearly superior to any competitive offering currently on the market. And that’s exactly what we did. If you’re in the market for the best earth drill, take a look at these features. Pneumatic wheels let you easily move the HYD-TB11H drill rig without damaging turf. The machine is incredibly well balanced, requiring less than 20 lbs. of force to pivot to the digging position. The towable design saves valuable truck or trailer space. Simply install the standard, removable tow bar, attach to your vehicle and go. We started with an 11 HP Honda engine. Then, we added a hydraulic system that’s second to none. This powerful combo generates up to 262 ft. lbs. of torque, letting you easily drill holes up to 16″ in diameter. The HYD-TB11H auger drill features convenient forward and reverse auger rotation and a three-position handle that permits drilling right next to buildings or other structures. An infinitely variable 20 degree auger tilt allows vertical drilling in uneven terrain, while our removable “no tools” tow hitch offers easy highway transport. The HYD-TB11H is built to last – welded steel plate and tube construction provide extra long life. By combining an inlet suction strainer with a 10 micron return filter, the hydraulic system is kept clean of contaminants. And the entire machine is backed by a one year, limited warranty. Forward/reverse hydraulic levers and an on/off switch are conveniently located on the three-position handle. An auger lock makes it easy to maneuver the HYD-TB11H around the job site. A large, 6.5-gallon hydraulic reservoir features a convenient sight gauge and a 10 micron return filter. The HYD-TB11H accepts all Little Beaver augers (standard, carbide, and rock), utilizing the same secure and simple snap button connection. 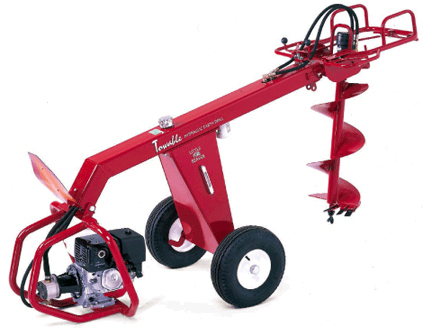 Either 36″ or 42″ augers can be used. The three-position handle rotates 180 degrees, allowing you to drill right next to buildings, walls, or other obstructions. An infinitely variable 20′ auger tilt provides vertical drilling in uneven terrain.